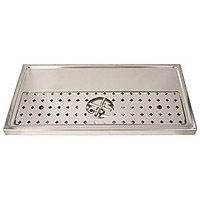 This Polished stainless steel rinser tray has a built-in glass rinser. Add some dispense excitement to each glass by simply inverting the beer glass and pushing down on the built-in sprayer. Cold water is rinsed over the inside of the glass! A wetted glass makes pouring the perfect glass of draught easier. Comments: We have three rinser drip trays in the restuarant that i manage, however I cannot find any information on how to clean them. The problem is that they are starting to stick in the spray position and getting both the bartenders and the guests a little wet each time. If anyone has any idea on how to clean these, please let me know.